Fatal Flaws of Leaders – CORE Consulting Inc.
What are the most common weaknesses of leaders? How do you compare? 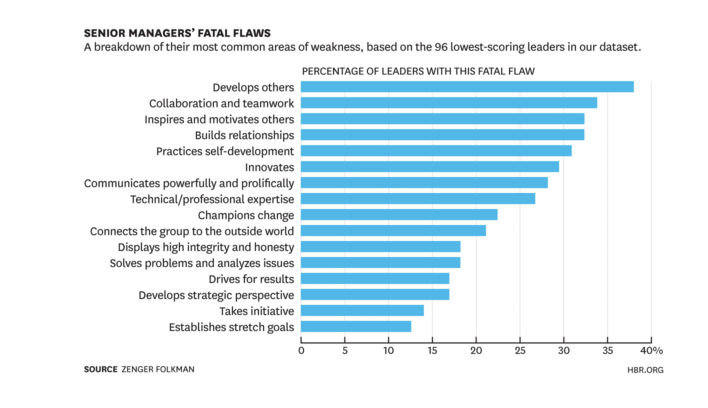 The data reveals that the most prevalent “fatal flaws” of these leaders are: developing and motivating others, building relationships and teamwork. Ironically as leaders climb the corporate ladder, these skills become increasingly important, as opposed to setting goals, developing strategy or driving results. The good news is that after receiving coaching 75% of the lowest rated leaders improved their behaviours as determined by subsequent 360° surveys. What do you need to focus on? Would coaching help you improve your leadership effectiveness? CORE offers a 360° tool that evaluates 16 key leadership competencies and a full suite of leadership training programs. We would happy to set up a complimentary meeting to discuss your needs. How Engaged Are You at Work? Is Your Mindset Holding You Back?